For the tech advancements, the banking sector of India is witnessing immense growth. But, the truth is, no service can run without any flaws. You certainly have an account with any of the banks in the Indian Banking sector. What if you are not satisfied with your bank's service? You would indeed file a complaint against the bank if you suffered any inconvenience so that the bank officials would take necessary steps to resolve your issue. It is practically not possible to address the complaint against the bank to the Indian judiciary that is already overburdened with infinite complaints. You would also not prefer to wait for a long time to file the issue and expect action against the issue. RBI- Reserve Bank of India introduced The Banking Ombudsman Scheme in 2006. The scheme allows the bank account holders to report complaints against the banks related to their services. You can expect a settlement of your complaint within a short time. The Ombudsman Scheme addresses the cases that don't need supervision of the court and are not complicated. There are certain grounds under which the complaints can be filed. You must learn about the grounds. If there is an unexpected delay in the collection of cheques, bills, drafts, etc. If you face non-acceptance of small denomination notes or coins for any reason or the bank charges commission for acceptance. If there is a delay in payment or non-payment of inward remittance. If your bank is not working in the prescribed banking hours. If the bank fails or delays to provide the services that they promised. There are several other reasons for which you can file a complaint against the bank. Important Note: Before filing a complaint to RBI, you must have made a written complaint to the bank and 30 days are over form the lodgement of complaint to the bank or not satisfied with Bank's reply. Step 1: Visit the RBI official website of The Banking Ombudsman Scheme https://secweb.rbi.org.in/BO/precompltindex.htm. To file a complaint against the bank, you need to follow the steps accordingly. If you have made a written complaint to the bank and not satisfied with the Bank's reply, then choose Yes option in first two fields and click on ok to proceed ahead. Step 2: You will be redirected to a new page where you need to enter Bank Name, Account Number, Complainant Name and Mobile number. Now click on Check Complaint. Step 3: You need to fill up an online application form providing the details for filing a complaint. 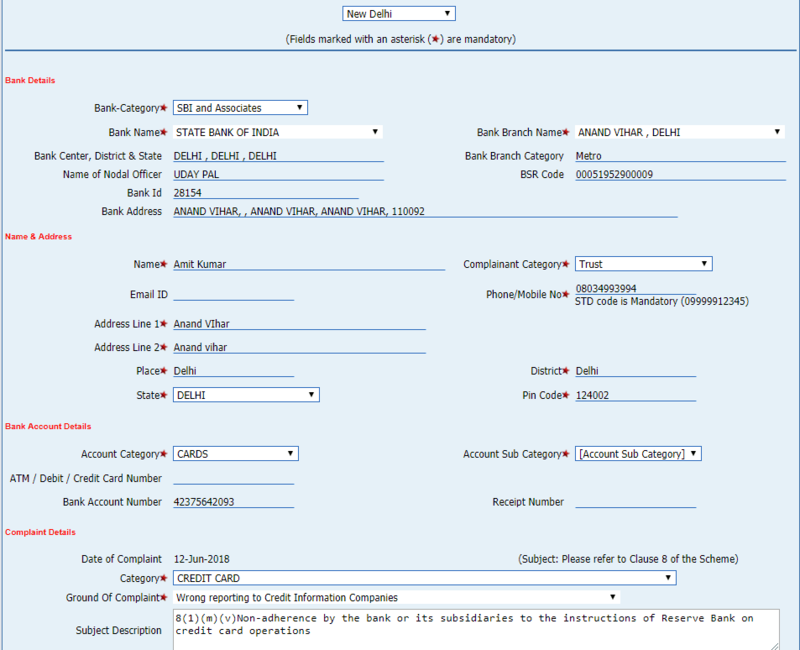 In Bank details, you need to provide the bank name and address of the bank's branch. Don't forget to choose Bank category. You also need to fill your name, complaint category, email ID, mobile number and address details. Next, enter Bank account and complaint details. Mention the facts for which you intended to file the complaint and described it. Make sure to mention the losses you suffered from for the bank's irresponsibility. Don't forget to mention the action you expect to resolve the issue. After filling all details, enter captcha code and click on the Save button. You will get an auto-generated email that your complaint has been registered successfully. Your complaint will get resolved with fast action. If your complaint is not considerable, you will receive a notification stating the reason. Visiting the branch is the last option for you. 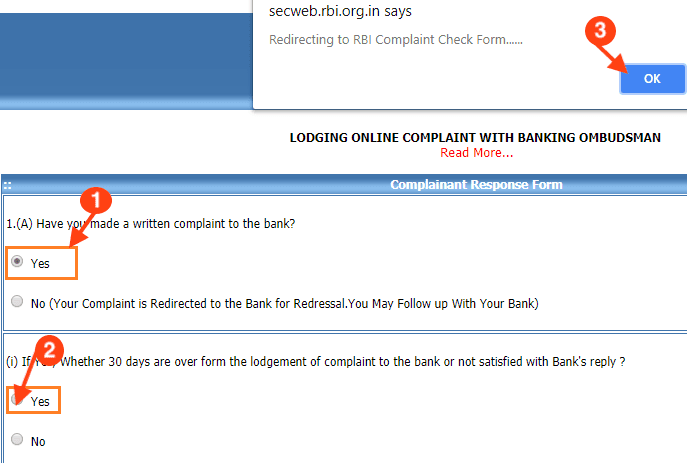 hello sir, I want to complain against RBI / New Delhi so please give me correct email id.